Windows Live Messenger is the next generation of MSN Messenger. It supports video chats, phone-to-phone, phone-to-PC calls and conventional text chats with full support for emoticons, font formatting and more. Windows Live Messenger integrates support for Yahoo!, enabling you to chat with your Yahoo! buddies from the same application. Other features include file sharing, SMS messaging, Live Contacts address book and more. 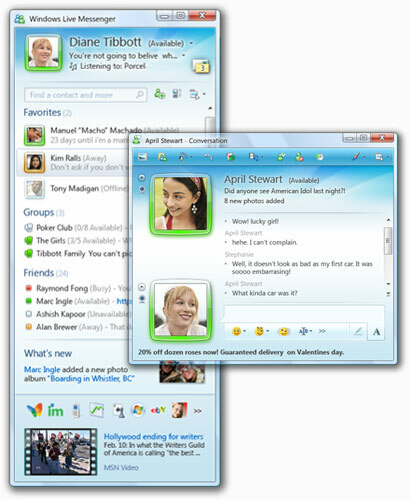 This version offers many improvements over the old MSN Messenger, and the video chat produces high quality, full motion video, even in full-screen.